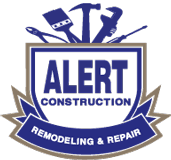 Alert Construction was contracted to change out an old fuse box and update it to a new breaker box to bring it up to code. Old fuse box that we were contracted to replace with new breaker box. New breaker box to replace old fuse box. This is a great local cafe that we did some work on after a telephone pole fell on their outbuilding. We repaired the roof and the fascia on the building outside, aswell as did some sheet rock work and painting on the inside of the great cafe. Had some damage to the fascia and we repaired it as we did the roof of the storage building. Another picture of the fascia repair with a great shot of the front of the building showing that they do catering also. Roof repair where a telephone pole fell on the building. Side view picture of the roof repair on the outbuilding at the Iron Hen Cafe. Closer look at the roof and the fascia work. We repaired some sheet rock on the inside of the Iron Hen Cafe and painted it. Another picture of the interior of the Iron Hen Cafe sheet rock repair and paint. Repairs made to customers houses. Some before and after pictures, and some are when the jobs were completed. Look at the great work that is done! Tree fell on customers home, and we fixed and repaired. Picture of roof after the storm damage from the tree falling on it was fixed. Repaired the header on the garage door. Replaced old outside light fixture with a new one that the customer wanted installed. New wax rings installed in toilet to keep it from leaking and to protect the hardwoods. The Deck was bolted to the house. Just think how sturdy it is now! We fixed this shower head that was missing. Not only was there a new shower head installed, but the other shower fixtures were replaced as well. A collection of walls before they were stripped of their wallpaper, or mold. Wallpaper border on cabinets had to come down. Incomplete paint job was ready for us to finish. Floral wallpaper with a border. Holes in drywall needed to be fixed. If you're a Redskins fan this basement is for you! These damaged walls needed to be repaired. Picture before the paint color was changed to a neutral. After picture when neutral color was applied. No Vanity Light, Had to be installed. The writing on this wall won't stay for long. Dark Paint in house before changed to a neutral color. After picture of interior wall that was painted with neutral color.